Birthdate : 23 September 1943. Birth Place : Bombay, Bombay Presidency, British India. Party Name : Bharatiya Janata Party. Mother's Name : Shobhna Samarth. Father's Name : Kumarsen Samarth. Siblings : Nutan, Chatura Samarth. Children : Kajol, Tanishaa Mukerji. Famous Films : Hamari Yaad Aayegi, Chand Aur Suraj, Nai Umar Ki Nai Fasal, Baharen Phir Bhi Aayengi, Sapnon Ka Saudagar, Do Dooni Chaar, Teen Bhuboner Paare, Pratham Kadam Phool, Haathi Mere Saathi, Mere Jeevan Saathi, Ek Jaan Hain Hum, Maati Maangey Khoon, Mohabbat Ki Kasam, Paap Ko Jalaa Kar Raakh Kar Doonga, etc. Awards : Filmfare nomination as Best Supporting Actress, Best Actress Award, Filmfare Lifetime Achievement Award, Apsara Film & Television Producers Guild Award, more. 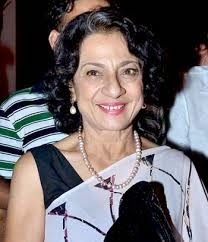 Tanuja is a very wonderful personality. Through out her film career she played a tremendous role in all fields such as comedian villan heroine drama and also in all types of negative and positive roles. She is very honest to her work. Any of her tremendous films when comes in mind all make us happy sad and proud. All her movies makes her a very huge personality. She always did the full disambiguation with all her roles offered to him. She is also very successfull in both her social and her personal life. Her name will remains in golden words always in bollywood history. Recent Tag : Tanuja Biography, Tanuja life history, Tanuja films, Tanuja life details, Tanuja Best movies, Tanuja birth detail, Tanuja Date of birth, Tanuja image.